Connect with wholesalers who may be interested in your product or service. By using this contact directory, you can start marketing to and networking directly with them. 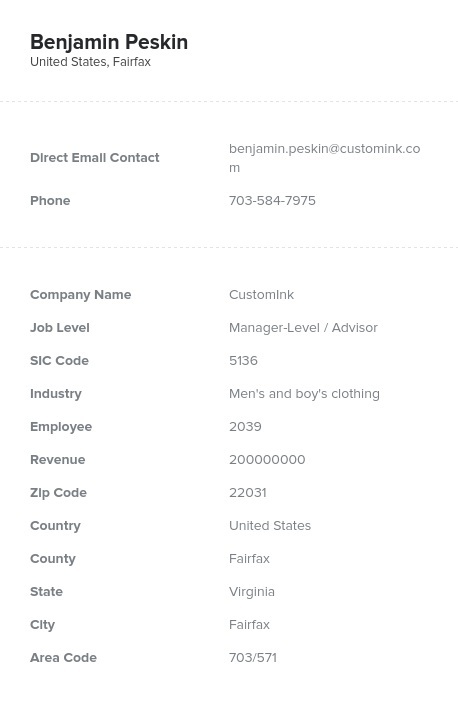 The wholesale industry is full of high-quality contacts, who you can reach out to using this email list. The wholesale industry moves, distributes, and sells large quantities of products to retailers and consumers. As such, professionals working in the wholesale industry need a wide range of tools to help them get the job done: safety programs, heavy lifting equipment, organizational software, maintenance management equipment, training tools, and many other related products and services. Perhaps the goods and services provided by your business would be relevant and interesting to this group of movers and shakers! Whether you plan to market a wholesale-relevant product, network with a widespread group of wholesalers, or find the best people to distribute your products, this list of sales leads and relevant contacts contains all of the relevant information that you need to make the conversation happen: direct emails, phone numbers, addresses, names, and more! Our premium, full contacts enable businesses to find accurate contact information about their target groups. We offer two different types of products: ready-made lists and customized ones created by our list-builder tool. This wholesale industry email database is of our many pre-built products and is ready for you to download right away. That means that you can use this huge wholesale mailing list to capture contacts from one of the most spread-out industries out there. Buy this list, connect with and email leads within the wholesale industry, and create strong B2B connections from across the miles today!